Powder Valley, a major vendor of powder, primers, brass, bullets, and loaded ammo, has received some large shipments of popular powders including Hodgdon Varget and IMR 8208 XBR. Powder Valley also has the hard-to-find Alliant Reloder 17 powder in stock, in both 1-lb and 5-lb containers. 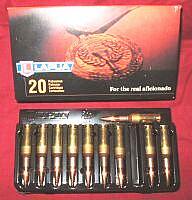 FYI, Powder Valley is now stocking quality factory-loaded ammo from Lapua, Hornady, Nosler, Prvi Partizan, and Wolf. If you’re looking for match-grade Lapua factory ammo or the Hornady .223 Rem, 6.5 Creedmoor, and .30-06 ammo, give Powder Valley a call at 800-227-4299. Powder Valley now posts recent product arrivals on Facebook. If you have a Facebook account you can link to the Powder Valley page to get the latest updates. IMR 8208: Finished up the backorders on 8208 8#. We received in about 200 kegs from Hodgdon last week and have filled backorders that were placed prior to June 25. Large shipments of primers received over the last couple days. Received 2 million Winchester, 1.2 million Federal, 1.5 million Rem and 6 million Tula. Also received large shipment of Winchester brass. Varget 8-lb jugs have arrived. We won’t update the website until Monday. Facebookers go ahead and put your order in now and you will get first dibs. Received in about 2 million Remington primers. Also, received a large shipment of backorders from Berger. We will be receiving about 125,000 Federal Small Pistol primers later this week and about 2-2.5 million in 3-4 weeks. We will begin listing these primers on the website August 3 so you can place an order if you would like. Share the post "Powder Valley Has Hard-To-Find Powders & Primers in Stock"
In Saturday’s Remington Band of Brothers (BOB) match and Mustin Trophy match, class winners from each relay go into a shoot-off. Each relay’s top shooter from the Any Sight, Palma Rifle, and Service Rifle categories then lines up against the other relay winners in their class. The course of fire for the shoot-off was ten shots in thirteen minutes. A major drama unfolded at the end of the regular shoot-off in the Remington BOB match, as “Any Sights” competitors Michelle Gallagher and John Whidden were locked in a tie. Michelle and John had both shot 100-8x. Now, to decide the winner, a “sudden death” shot-for-shot rifle duel took place to determine the class winner. The crowd tensed as both shooters went to the line. Both Michelle and John proceeded to hit 10s (or Xs) for the first twelve (12) shots. Then it was unlucky #13 for John. Whidden’s 13th shot was a nine, against Michelle’s ten. That gave Michelle the Remington Band of Brothers match Any Sight Class victory, but onlookers congratulated both shooters. John Whidden redeemed himself later in the day, winning his “Any Sight” Class in the Mustin Trophy shoot-off. John posted a “best-in-class” 100-8x, making him the “Any Sight” winner. We talked to John after the match and he told us: “That was an exhausting day. Rain was forecast for the afternoon and some of the relays got heavy rain which increased the difficulty. Michelle shot great in the Band of Brothers Match, but I was pleased to come back and shoot steady for a Class win in the Mustin Match. Now we’ve got a lot of shooting ahead of us and I’ll try to stay up near the top.” John is shooting a .243 Winchester with moly 105gr Berger bullets. 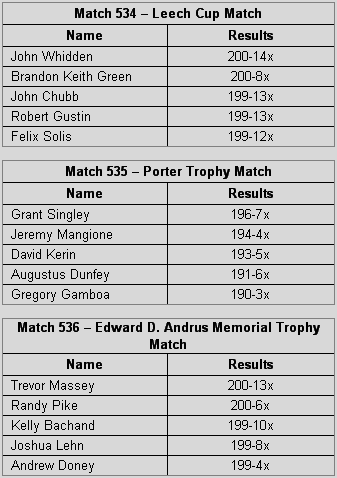 In related news from Camp Perry, here are the preliminary scores for the three long range matches shot Sunday morning (August 15th). The course of fire was 20 shots, slow-fire prone at 1000 yards. The high-scoring competitor from each relay of each match will compete in the shoot-off held immediately after the the completion of the Herrick Trophy Team Match. Photos and match results courtesy NRABlog.com. 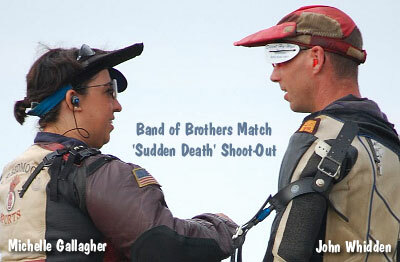 Share the post "Michelle Gallagher vs. John Whidden in ‘Sudden Death’ Shoot-Out"